Start by making the hot dog booklet. I like to use 11" x 17" copy paper or 12" x 18" drawing or construction paper but you can use standard size copy paper for a smaller book. Measure the size of the finished hot dog booklet and get a piece of stiff paper for the cover. I use cover stock that I get from a printer but you can also use cereal boxes, cut up file folders, or oaktag. Cut the cover paper so that it is twice as wide as the folded pages plus 1/2" and 1/2" taller. (Example: 11 x 17 paper makes pages that are 4 1/4" x 5 1/2". I use covers that are 6" x 9".) A ribbon tie makes a nice addition but is not necessary. 1. Fold the cover paper in half. 2. Lift up the top page of the book and stick a piece of scrap paper inside. This will protect the rest of the pages when you glue. Cover the entire top surface with glue. 3. Take out the scrap paper and fold it in half with the glue inside so that nothing will stick to it. 4. Wrap the ribbon around the spine of the book and adjust the two ends so that they are even. 5. Put the book inside the cover so that the spine of the book rests on the fold of the cover. Smooth to help the glue adhere. 6. Insert scrap paper and put glue on the back page. Pull ribbon across, close cover, and apply pressure. 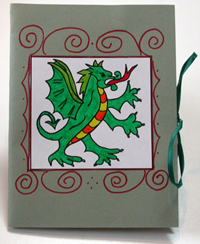 You can print out dragon and unicorn patterns to glue on the cover. 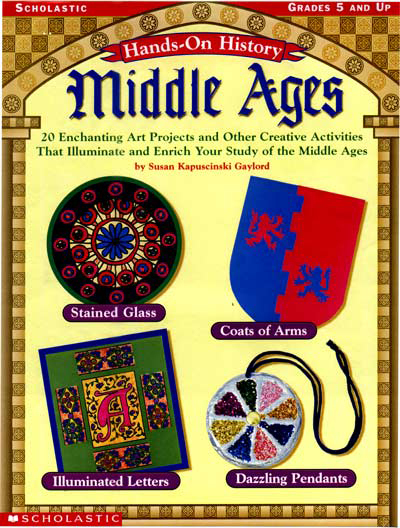 For more activities and information related to the Middle Ages, check out the book I published with Scholastic in 2002. Hands-On History: Middle Ages has eight sections about life in the Middle Ages: Who They Were, How They Lived, What They Wore, What They Ate, How They Worked, How They Played, How They Learned, and How They Worshipped. Each section has teacher hints, informational text written for children, and hands-on activities. A thorough site, written for kids with a section on how manuscripts are made, a slide show of manuscript pages and descriptions, a glossary of terms, and directions to make your own medieval manuscript. Learn about castles and medieval towns by touring a Lego construction. For anyone with kids who like Legos, this will be an inspiration. Recipes and information on preparing a Medieval feast. Well organized and clearly displayed links to Medieval resources. Thanks Susan, I think I'll try this with my 4th or 5th graders... I like your site's design too!